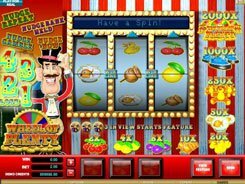 Fruit Fiesta is a must-play slot fitted with three reels and three paylines. The symbols are a bell, watermelon, orange, plum, pineapple, BARs and sevens. This obviously simple game has a twist that would make you come back time after time again. 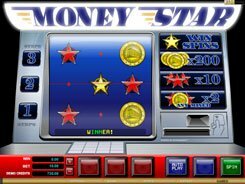 Its classical Vegas-style arrangement is augmented by a progressive jackpot up for grabs. Before setting the reels in motion, you should place a bet. The betting settings are limited to toggling between the number of lines you want to bet on. A coin denomination is fixed at $0.25. 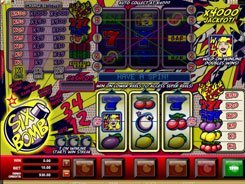 Each payline accepts a single coin per spin, so the maximum bet amount is $0.75. 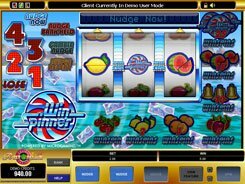 Rolling up three wild symbols on line #3, you take down a progressive jackpot. 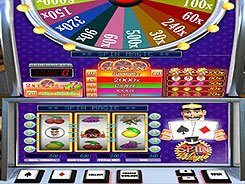 You qualify for a jackpot if you bet the maximum of three coins per spin. 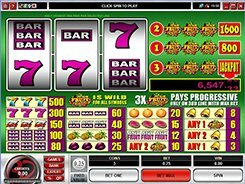 Apart from an alluring progressive jackpot, you can still earn money hitting matching symbols on active paylines. 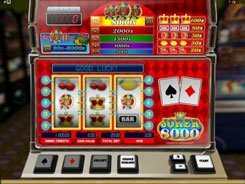 The largest fixed jackpot in the slot is 500 coins won for three Rainbow Seven symbols.